Profiles are like buckets–an object to store all your AddThis’ tools and metrics for a particular website so that everything can be grouped within one container. This is useful if you have multiple websites and wish to separate your analytics and tool configurations across the many websites you operate. For example, your website about ‘Cereal’ and your website about ‘Orange Juice’ can be separated into 2 different profiles. This way, each site can have its own distinct tools, design and analytics so that they never mix together. Just like how you should never mix cereal and orange juice together–yuck! Each profile is identified by a Profile ID, which is included in the AddThis code provided in the ‘Get the Code’ page. This unique ID allows us to know which website’s metrics should be reported to which AddThis profile and which profile’s tools should be deployed to which website. 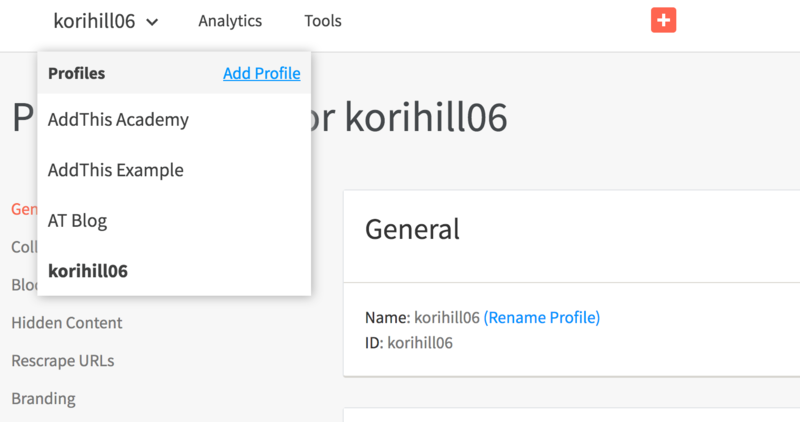 Last but not least, you can manage all of these profiles with just one account login! You can also share any of these profiles with a colleague or key stakeholders via our ‘Collaborators’ feature without having to share your account login information or access to your other profiles. Enter a name for the new profile and click ‘Add’. Your Profile name can be changed anytime in your Profile Settings. How can I find my Profile ID? How do I access my other profiles? If you have more than one profile in your AddThis account you can toggle between them by hovering over the Profile drop down located in the top-left of the AddThis navigation menu. To edit your profile, click on “Profile Settings” in the navigation bar located in the top-right. This is where you can share and give your colleague or stakeholders access to this specific AddThis profile. More details below. Sometimes people will scrape your AddThis script from your site’s source code (which is publicly accessible through the browser ‘view source’ feature) and insert it to their site. While we don’t know the reason for this, we can only speculate that it’s because they just want to replicate your awesome web tools on their own site. In any event that they do, our dashboard inadvertently records their site’s metrics and report it in your analytics. To filter their site’s analytics from mixing in with yours, you can use this feature by clicking on “Add Website” and then selecting the domain you wish to block from your analytics report. This feature is specifically for the Related Post tool. If you wish to hide specific content from showing in the Related Post tool, just enter the URL you wish to hide. Hide this exact URL – Insert the exact URL you wish to hide from displaying. Example: www.addthis.com/academy/what-are-addthis-profiles/ This example will hide that specific page only. This feature is specifically for the Related Post tool. If you’ve recently updated your Open Graph tags and would like for the cards in your Related Post tool to reflect the new change in title, description or image, just insert that URL to manually rescrape them. Use this feature to minimize the AddThis branding across your website tools. This is for our “Email Share” service available in the sharing buttons. With our email sharing service, we allow you to customize the look of the emails sent to the end-user to match your organization’s branding. Templates can be created with text-only, or a combination of HTML and text, in which case the user’s mail client will determine which is displayed. Learn more here. If you develop an application using the AddThis Sharing Platform and want to receive analytics reports, you must first register your app. You will receive an API Key to include in your code to enable tracking. Learn more here. This is for the Twitter sharing button and is how you can shorten shared URLs in your tweet by integrating with your bit.ly account. After you’ve connected your bit.ly account, you will then have to insert a piece of code into your site so that URLs can be shortened. This code can be found here. This is for the AddThis WordPress Plugin. If you’ve linked your AddThis account in your WordPress plugin, you can switch to the WordPress type if you want to access additional settings in your tool configuration that is specifically available for just WordPress sites. How can I share my AddThis Profile? If you wish to share your Profile with another AddThis user, whether that person is a colleague, client or stakeholder, you can do so using our ‘Collaborators’ feature located in your ‘Profile Settings’. Open the profile you wish to share by selecting the profile from the drop-down in the upper-left hand corner. Enter the email address of the person with whom you want to share access to. It should be the email they used when they created their own AddThis account. Select the access level you wish to grant the collaborator. View reports only – Giving this access level only allows the collaborator to see your analytics reports and they do not have permission to make any changes to this profile. View and make changes – This access level is similar to being an ‘admin’ where the collaborator can not only view your analytics but can also alter any of your profile settings including activating any new tools in your profile. We’ll then send this person an email saying that you’ve requested to share your profile with them and asking them to confirm if they wish to have your profile added to their AddThis account. If they do not have an AddThis account, they will be asked to create one and from there will automatically be given access to this profile.